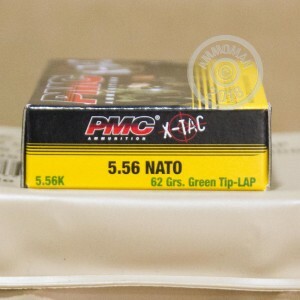 PMC X-TAC 5.56x45mm ammunition is a high quality option to run through your AR-15 or any other 5.56x45mm firearm. These new production rounds are loaded into factory fresh brass cases that come boxer primed and can be re-loaded. Each projectile in this 120 round battle pack is a 62 grain green tip that has a steel core. 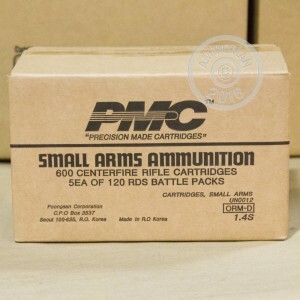 PMC conveniently packages this ammo into sealed plastic battle packs to ensure your ammo stays dry and corrosion free until you need it. These rounds are loaded to mimic the M855 penetrator rounds. PMC X-TAC rounds are perfect for high quality range training or adding to your stockpile. Precision Made Cartridges or PMC has been producing ammunition since 1968. They are the exclusive ammunition manufacturer for the South Korean Military. Due to their unique vertical integration, they are able to control the quality of raw materials coming into their factories resulting in consistent and reliable ammunition going out. 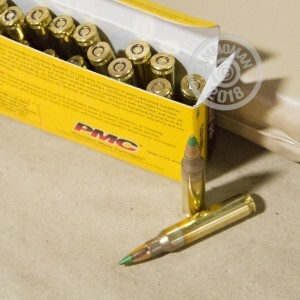 PMC loads their ammo to meet SAAMI or MIL-SPEC standards depending on the caliber. Don't forget, at AmmoMan.com all orders over $99 qualify for Free Shipping! So if you order two or more of these high quality battle packs the shipping is on us! Put 110 rounds of this downrange. No jams, no misfires, no problems. Good place to do business. Speedy delivery. Great people to deal with.